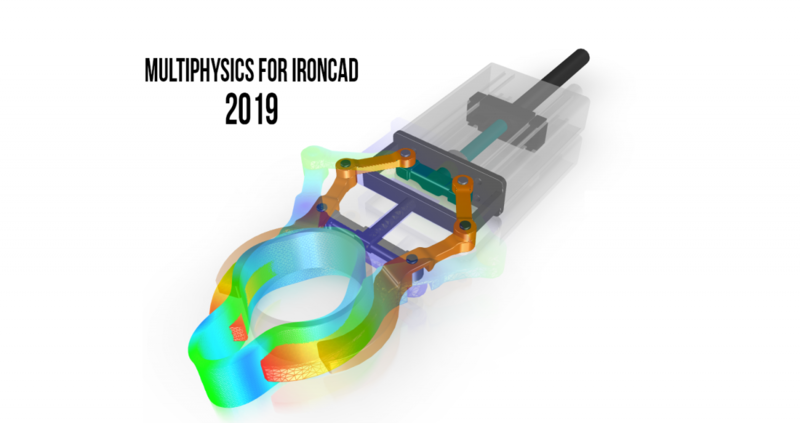 (Atlanta, GA) January 24, 2019 – IronCAD, the 3D CAD platform of choice among metal fabricators and custom machinery manufacturers, formally announces the much-awaited release of Multiphysics for IronCAD (MPIC) 2019, the newest version of our integrated FEA simulation tool. With the advent of our newest features and updates, built to quicken design cycles, simplify analysis setup, and reduce analysis times, IronCAD has improved and refined MPIC, further increasing the ease of use and functionality of our widely touted FEA simulation software. In addition, new results review features (comprised of new contour coloring controls and more extensive result displays), enhanced stabilization processes and improved contact pressure predictions allow users more accurate and realistic design analysis earlier in the digital prototyping cycle, and with this array of enhanced assembly analysis functionalities, designers and users can enjoy quicker, more granular element-evaluation from the onset of their designing process. In short, our latest version of IronCAD Multiphysics provides the technical and functional prowess our engineers and users need to create stunning and, more importantly, accurate FEA simulations for all proficiency levels. To try MPIC now for free, visit https://www.ironcad.com/free-online-trial/ and start your free online trial of IronCAD that includes MPIC.